Andre Stolz is accustomed to being in the hunt in professional events with nine career victories to date, including two this year on the One Asia Tour and one on the PGA Tour in 2004. Following the second round of the NSW PGA Championship Stolz sits in striking distance to claim another title, two behind tournament leaders, Martin Dive, James McLean and Brent McCullough who are a 9-under-par. Dive, McLean and McCullough enjoyed early morning tee times when conditions at Wollongong Golf Club were favourable towards low scoring. It was an opportunity they fully capitalised on, with the afternoon groupings struggling in the tough windy conditions. Dive built on his opening 62 with a second round 69 and goes in search for his first professional victory. McLean’s second round 67 added to his opening 64, with McCullough opening with a 67 to them progress to card the day’s low round with a 64. The trio move into the final round one shot clear of Matthew Millar, Josh Younger and amateur Jake Higginbottom who are at 8-under-par. A further shot back on 7-under are Stolz, Scott Arnold and Michael Wright. It is the experience of seasoned journeymen such as Stolz and Wright who are the players to watch during the closing stages of this tournament. Wright is coming off a victory at the Western Australian PGA championship a few week’s back and in 2005 won the NSW Open Championship. The Queenslander is eager to continue his fine run of form leading into next week’s Australian Open and would like nothing better than to secure another win at Wollongong. Stolz is a tenacious competitor and thrives in being in the heat of battle. Keep in perspective that Stolz’s second round 71 was carded in extremely tough and challenging conditions late in the afternoon when the gusty north east wind lashed the Wollongong links layout and his efforts this week are even more impressive. Players in the afternoon groups were using a extra two club approach on the closing holes into the wind. Stolz’s experience was reflected in his display of pure grinding links golf which kept him in the tournament as others faulted. Stolz is off a fantastic year playing in Asia, winning the Thailand Open to add to his Indonesia PGA Championship to be currently leading the One Asia money list with USD$ 449,074. 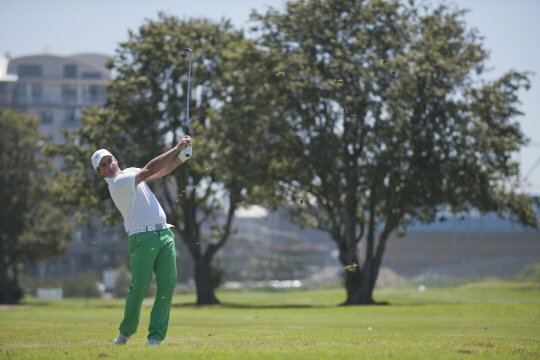 With plans to return to the US next month to the PGA Tour qualification series, Stolz has rejuvenated his game with a focused towards returning to the main golfing arena after a period away from the game running his own business on the Central Coast. A win in Wollongong for Stolz will serve as the perfect launch pad heading into the Australian Open, yet he has some work to do with numerous players making their way into contention in this tournament. HIgginbottom, Younger and Arnold are young and dangerous and are also in striking distance of the title. None have won an Australasian Tour title, although Arnold came close here in Wollongong in 2009 when he finished runner up to Aaron Townsend. Yet you cannot go past Stolz’s chances of claiming the NSW PGA championship title as he’s the inform player leading into this event following a stellar season on the One Asia Tour. Stolz’s knowledge and experience will serve the 41-year-old well during the closing stages of this tournament, particularly should the tournament come down to the wire as it should with sixteen players within four strokes of the leaders.